GPs and other clinicians taking responsibility for North Yorkshire's NHS budget are set to be the only such group in England saddled with debt. The county's primary care trust (PCT) said it would end the financial year with a deficit of £19m. In April it will be abolished and its finances passed to four clinical commissioning groups (CCGs). York's CCG said managing the debt while maintaining quality of care would be an "enormous challenge". Christopher Long, chief executive of North Yorkshire and York PCT, told BBC Radio York: "We are currently the only primary care trust in England declaring a deficit. "We have been told that this deficit will be passed on proportionally to the clinical commissioning groups across North Yorkshire and the national NHS Commission Board in the next financial year. "We are unable to state how much of this deficit will be passed on to each organisation at the moment as this is still very much a work in progress and could change towards the end of this financial year." The replacement of health authorities and PCTs is part of a government restructuring of the NHS. A report commissioned by the North Yorkshire and York PCT into how savings can be made is due to be published next week. 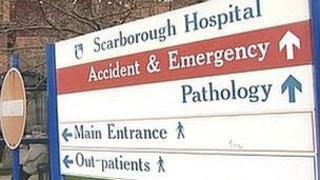 Cutting emergency cover during the night at Scarborough Hospital is one of a range of measures being considered. Professor Alan Maynard, chairman of the Vale of York CCG, said other PCTs across England had managed to balance their books. He said: "The reforms are very bold... but they still leave us with this big deficit and the question is how to manage that away. "It's an enormous challenge. Hopefully, by working with the local hospitals and working with the GPs we can find some economies. "It's not easy, there'll be some challenges for us all, in terms of patients and in terms of the organisations. "There's waste out there, we know that. The hope is that by working more closely with hospital doctors and others the GPs can work a few minor miracles."